Matilda Browne’s talent was apparent from an early age. By the time she was nine, she had begun informal study with her neighbor Thomas Moran. As an adult, she exhibited widely and won prestigious awards. The only woman accepted as a peer by the male artists in Old Lyme, she was given the honor of being invited to paint a pair of door panels in the Florence Griswold House. 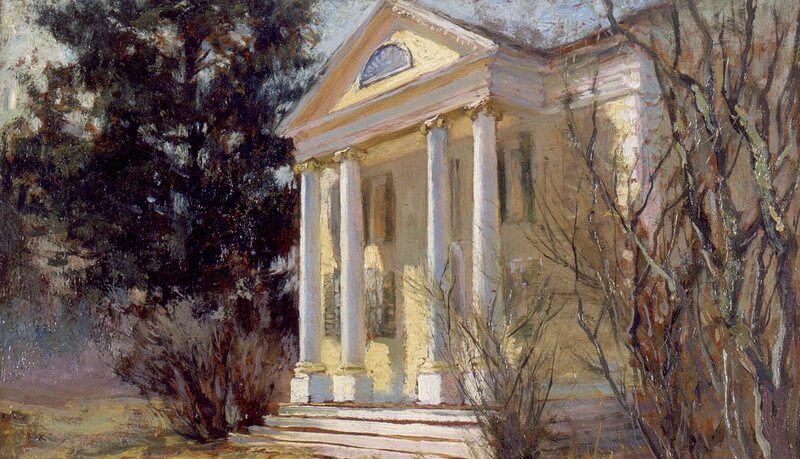 In Greenwich, where she lived most of her adult life, she was a founder of the Greenwich Society of Artists and exhibited in all of their annuals from the first, in 1912, through 1931. Yet this will be her first solo exhibition in more than eight decades and the first ever in a museum. The exhibition and its accompanying catalogue will enable the rediscovery of a significant artist. 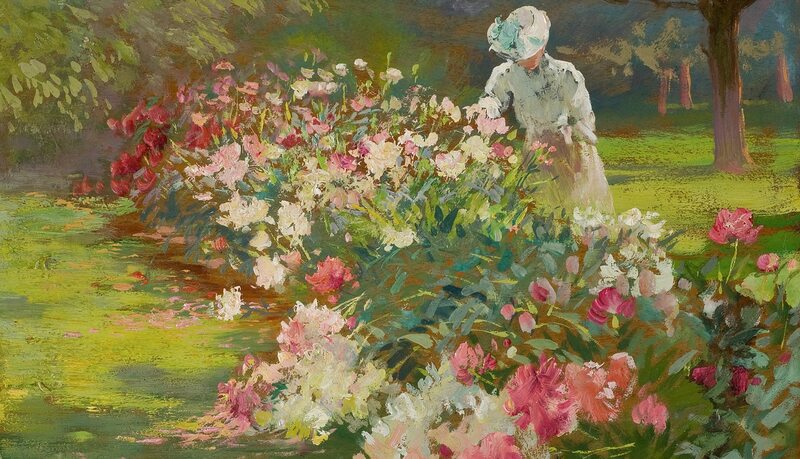 Throughout her career, Browne favored two themes: animals and flowers. Visitors to the exhibition will be able to trace her shift in style from highly accomplished academic depictions of farm animals to atmospheric Barbizon-influenced canvases. 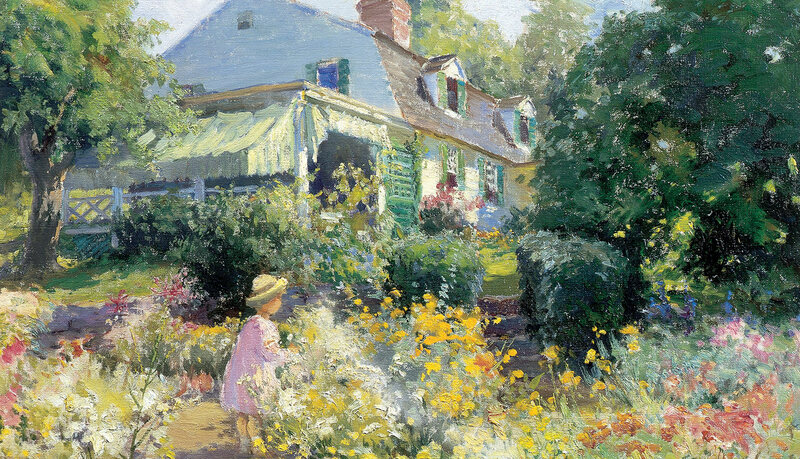 Her Impressionist style is most evident in sparkling paintings of gardens as well as in still lifes of lush bouquets. Susan G. Larkin, independent art historian, is the author of The Cos Cob Art Colony: Impressionists on the Connecticut Shore (National Academy of Design and Yale University Press, 2001) and was the curator of the exhibition of that title. She is the author of American Impressionism: The Beauty of Work (Bruce Museum, 2005) and Top Cats: The Life and Times of the New York Public Library Lions (2006), and, with H. Barbara Weinberg, co-author of American Impressionists Abroad and at Home: Paintings from the Collection of the Metropolitan Museum of Art (2001). She has contributed essays to the New-York Historical Society’s exhibition catalogue The Armory Show at 100 (2013); the Metropolitan Museum’s catalogue Childe Hassam: American Impressionist (2004), and the collections catalogues of the Detroit Institute of Arts, the Corcoran Museum of Art, Williams College Museum of Art, Memorial Art Gallery, University of Rochester, and New Britain Museum of Art. She received her Ph. D. from the Graduate School of the City University of New York.